There had been an older pump that was part of what had been the White Hart pub near The Plain at the bottom of the High Street. Probably this older pump was the one referred to in the Gloucestershire Quarter Sessions Order Book at Michaelmas 1725. “Inhabitants of Thornbury indicted for not repairing their Town or common pump. Fined £10 to be levied and raised by an equal rate of by Thomas Alway, John Hughes and Thomas Lewis on lands, tenements and hereditaments of the land-holders and inhabitants of the whole town by distress and sale of the goods and chattels of the landowners and inhabitants refusing to pay their several proportions, which sum is ordered by this court to be expended on the reparation of the said town or Common Pump“. When the White Hart pub was demolished to become a bank in 1857 it was agreed that the original well could stay near its wall but the bank also paid for something rather more conspicuous to be built (possibly an early advertising venture) right outside their premises. We have been told that the parish records of St Mary’s Church in Thornbury show that the new well was dug at The Plain in November 1859. A pump was also installed by the bankers, Messrs Harwood, Hatcher and Sams. This well with its pump was now not near the wall at the side of the road but actually in the road. This pump became the subject of considerable controversy in Thornbury. The Gazette of Saturday October 4th 1924 contained a brief account of the Thornbury Pump story which is probably as accurate as any. It explained that the idea of removing the pump was apparently first mooted when it was suggested that the pump be replaced with a memorial to Queen Victoria. This idea was vetoed. However in 1919 the possibility of removing it was again introduced – this time to replace it with a memorial to those who fell in First World War. The Gazette of 22nd December 1923 now reported on the disuse into which the pump on The Plain had fallen. It was felt to be an eyesore, according to the Gazette. The article said that a proposal had once been made to remove the pump and replace it with a clock tower. The Council had at that time received assurances that the pump could not be moved because it was needed for washing vehicles and so the pump had been kept. The Gazette article expressed the opinion that as the pump had now fallen into such disrepair this argument could no longer be made. Two photographs here were both taken in September 1924. The photograph above on the left was taken the day before the District Council removed it. The other image, on the right below, was taken two days later when the fight to have it restored had begun and it was rescued from the tip where it had been dumped. This photograph shows that flowers have been placed on it. Below on the left we have a thumbnail image of one of the groups of people who gathered to protest about the pump’s removal. Please click on the image for a larger photograph. The tall gentleman on the right is Mr Cullimore who was the owner of local businesses such as the sawmill and a councillor. In 1924, after the proposal to remove the pump was yet again turned down, the issue became an emotive one. The Rural District Council suddenly decided that it was an obstruction and in the interests of the road users to remove the pump altogether, which they did on Monday September 15th. One hundred and thirty two ratepayers signed a letter to the District Council demanding the return of the Pump. One person wrote and asked how much longer he would have to wait before he could wash his trap, which he was wont to do in the road by the Pump – perhaps not the best argument to defend what was claimed to be an obstruction in the road. 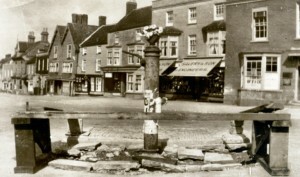 The photograph below shows the first attempt to restore the pump to its proper home. It was brought back on a wagon by a very excited crowd and apparently there was a placard on it saying “This pump belongs to the ratepayers of Thornbury.” The police feared a riot. On October 4th a protest meeting of “the electors of the special drainage district of Thornbury” was called. At the meeting Charles Symes argued strongly that the road was 36 feet wide, that there was enough room for five cars to pass abreast, that the pump had been there for generations and was a public well and that no accidents had ever happened as a result of the pump being in the road. Mr A C Pitcher moved the resolution that the pump should not have been removed without the consent of the ratepayers and ordered for it to be returned and reinstated and there was a discussion about whether the councillors concerned with removing it should pay for its replacement and that of the two gas lamps that had been on it. Mr A C Pitcher admitted that he knew that the Council wished to remove the pump but “he told them he would think it over. 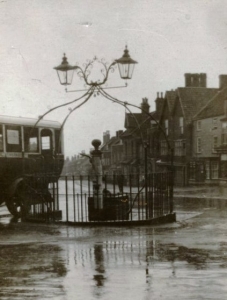 Before he had time to do so it was taken down.” George Bernard Symes and Mr Riddiford, who were local District Councillors, said the pump had not been used for two years and that the very people who were campaigning to have it returned had petitioned to have it removed. They felt the pump was dangerous and there should be an electric standard instead. It becomes clear from these reports that the issue was dividing families. Charles and George Bernard Symes for example were uncle and nephew. The Council took legal opinion and decided that the pump had been installed illegally on the highway where it was an obstruction and should there be an accident the Rural District Council would be liable. The pump was once more removed. However the Council may have learned its lesson. The pump in Bull’s Eye Lane had also fallen into disrepair and the Council discussed its future. It was a very deep well and hard to work and it had become possible to put in mains water from West Gloucester Water Company. It was suggested in the light of “recent events” it was necessary to consult the residents and their opinions. The Thornbury Gazette, June 13, 1959 had an item which sheds more light on the size and position of the well that provided the water for the pump. This might of course have been the original well by the White Hart. 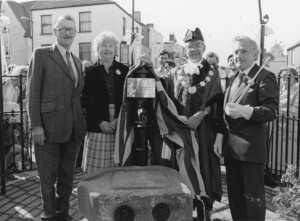 The saga of the Pump was brought full circle in 1984 when a replica was installed on The Plain near the site of the one that had been an alleged traffic hazard. Avon County Council had determined that the site was suitable for a traffic island as a traffic calming measure and to provide a refuge for pedestrians crossing the road at that point. A local group “Concern for Thornbury” thought that it would be a most suitable opportunity to restore a much loved feature of the town and drew up plans to have the pump placed on the traffic island. Thus the final irony in the story of the pump is that its restoration was part of a traffic safety measure! 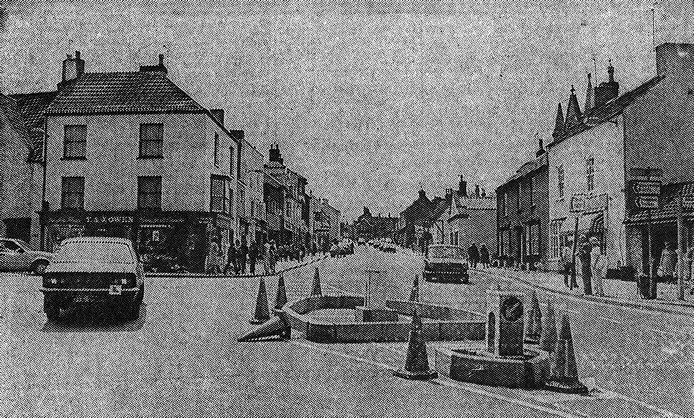 The thumbnail image on the left shows an extract from the Gazette of June 1983 when the work of installing and trialling the traffic island had begun. The new pump is part of the image of Thornbury and is a beautiful addition to the town’s entry into the Britain in Bloom competition. The canopy around it was designed by a local architect, John Webster, and based on the original design. The work was completed by craftsmen at Almondsbury Forge and installed by them at a total cost of £1948.96 plus VAT. The pump itself was an original Thornbury pump from a different site near the old market. It was donated by Lyndon Hawkins who had rescued it from the junction of Bath Road and Rock Street when it was removed as a health hazard, after its water source had become polluted. It was never officially determined what had happened to the old one. Some people say it had been hidden down a well or in the quarry and others feared that it had been melted down to prevent another unofficial attempt to restore it. 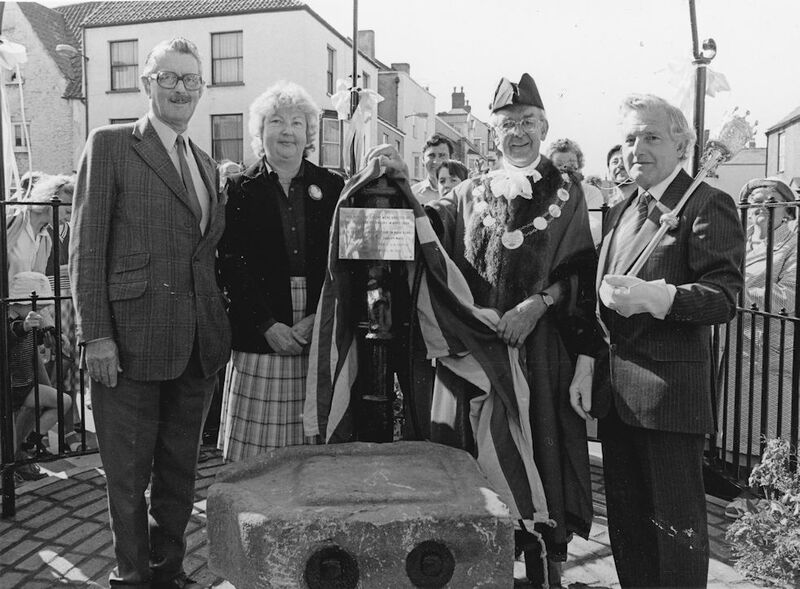 The new pump was formally inaugurated on 28th April 1984 by the then town mayor, Francis Hopkins. The thumbnail image on the right shows the ceremony. Please click on it to see Lyndon Hawkins, Sheila Eardley-Wilmot (vice chairman, Francis Hopkins, and Peter Birkett town councillor and mace-bearer. The pump now in the middle of the road at The Plain by the way has a very interesting top to it which has been likened to a “fruit tart” and we would like to hear from anyone who knows why it is different from the usual pattern of pump tops.